It's not too early to get a start on Christmas cards! We're already more than halfway through this year (yikes! ), and Christmas will be here before you know it. 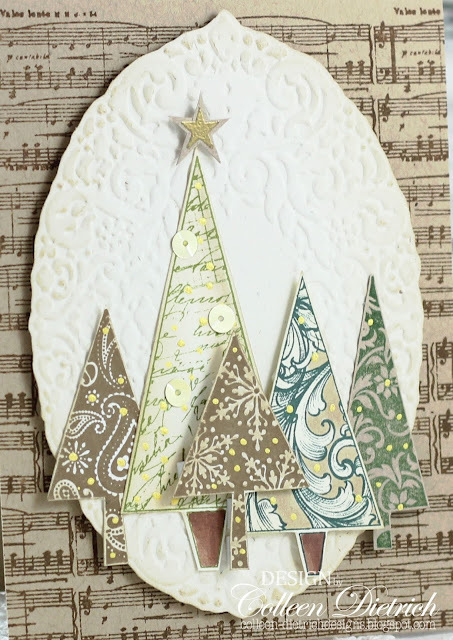 My inspiration for this card is the song, O Christmas Tree. 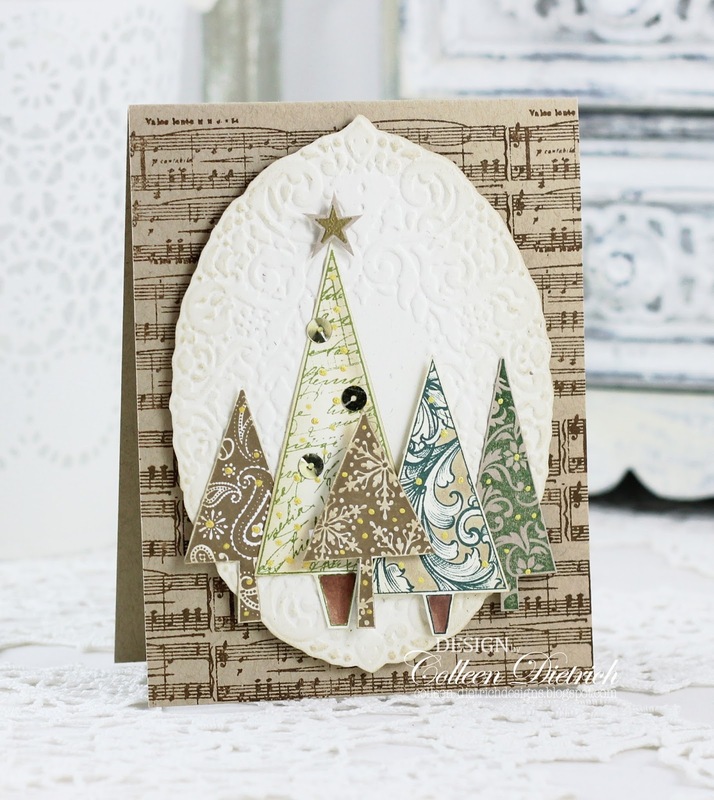 I used a musical note background stamp from Skipping Stones Design on a kraft card base. 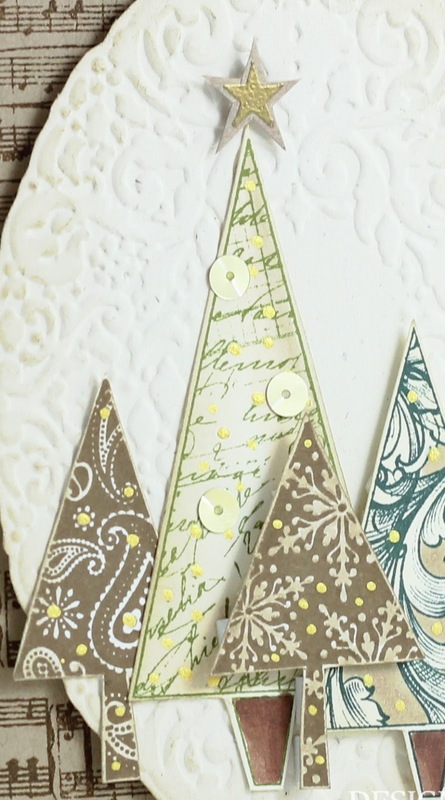 Then, I built a little 'forest' of gilded trees on top of an embossed oval. The trees are from both Hero Arts Merry Christmas Trees and Stampin' Up! 's Patterned Pines. The gilding comes in the form of gold Smooch ink, some golden sequins, and a gold-embossed star. O so pretty -- love the array of patterned trees and musical background. The gold adds a nice touch of elegance. Absolutely beautiful! Love the pattern papers for the trees! Gorgeous rustic Christmas Card Colleen! Your work is always so inspiring! The flowers are Cricut Flower Shoppe cartridge cutouts. After I rolled the flower I added a flower stamen in the middle. You're right, it's never too early and I should get started, but just can't seem to get there. Love the music background on this, especially in the brown on kraft. I always love a cluster of simple trees like this, too. This is so pretty, Colleen! I love the patterns and colors you used! Oh, I LIKE this!! Those trees are so pretty, what a fabulous card!